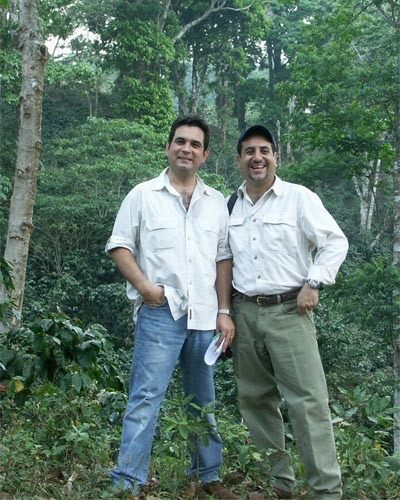 Finca Santa Marta is located close to Victoria town in the Yoro District of Honduras. The 23 hectare farm was bought by the Hawit family in 1963, although the family started in the coffee business in 1920. Finca Santa Marta produces about 17 tonns of organic coffee annually from the loamy soil some 1300 meters above sea level. They produce two main varieties, Catuai and Pacamara, both of which have gained a great reputation. They have always achieved good results at the Cup of Excellence competition, coming 1st in 2006. Then Ana Lucia Hawit came 1st in the Honduran Barista Championship, and 15th in the WBC held in Copenhagen in 2008 using the family's own Finca Santa Marta coffee. The coffee is shade grown under Guama, Liquidambar, wood trees, Guanijiquil and Musaceas giving the abundant wildlife a good habitat. The fertilizer is made on site with the assistance of California worms with supplements of nitrogen, phosphorus and potassium when necessary. Only ripe cherries are hand-picked between January and March and this is controlled through continuous education of about 25 seasonal staff, who, in addition to training, are paid wages that are 30% higher than average for seasonal workforce. The coffee is fully washed using local spring water which is treated in separation tanks prior to it being recycled into the environment before being sun-dried on concrete patios. Aroma: Penetrating floral aroma (jasmine like). Body: Medium to full body with a creamy character. Acidity: Medium to high acidity (crisp, juicy and bright). Flavour: Very complex, with different flavours including: chocolate, clove, cinnamon, vanilla, berry-like. After taste: Pleasant and long after taste with a sweet final note. Check out the details of the Finca Santa Marta Coffee Farm, and see where the coffee beans came from.